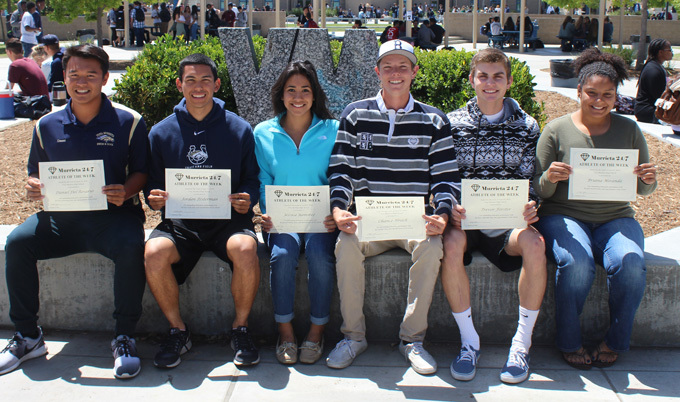 From left: Daniel Del Rosario, Jordan Testerman, Jessica Ramirez, Chance Hroch, Trevor Forster, Briana Miranda. Not pictured: Kristal Dennis. Pitcher Chance Hroch has a 7-2 record and 1.18 ERA as a pitcher for the baseball team, which is 15-10 this year. Jordan Testerman of the boys track team tied for third place in the 100 meters in 11.13 seconds in the Inland Empire Championships last week. Kristal Dennis of the girls track team took third in the triple jump at the Inland Empire Championships with a mark of 35-8. Trevor Forster of the boys volleyball team averaged 9 kills and 13 digs per match last week. "He stepped up and had doubled his kills in games," said his coach, Kristen Cooke. "He also continues to use his leadership skills on the court." Briana Miranda of the girls lacrosse team was 15 for 16 in blocks in a recent game against Chaparral. She carries a 3.5 GPA and is considering both Delaware State University and Hood College. Swimmer Daniel Del Rosario broke one minute in the 100 backstroke in a recent meet. Jessica Ramirez of the girls swim team took part in a wild card relay race, not knowing what the end result would be, and performed well for the Broncos in a recent meet.